10% of the population is left handed. That would imply that 10% of theremin players is left handed. Turning your theremin around on its stand, and playing it from the back is definitely the fastest solution. 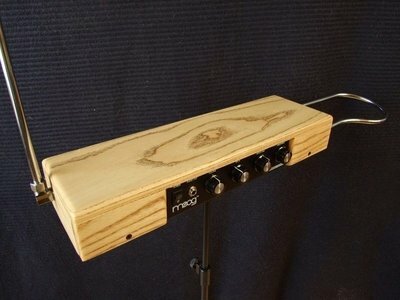 Now you can also send your theremin to us, and have it rebuilt to be a fully lefthanded theremin. This way you keep easy access to your front panel knobs. What will happen is this. We remove the side panels and replace them with new ones. The circuit board is mounted upside down, and a second hole is drilled in the back of the cover to allow access to the power supply. The circuit board will be turned upside down. To allow access to the tuning coils, we'll drill small holes in the bottom. The conversion can be done on both the Standard and the PLUS version of the Etherwave. If this is the thing for you, please contact us first at info@ethermagic.eu . You will be responsible for the shipping to us, and provide us with the shipping tracking details. We will return your theremin to you using our usual shipping company. Please note that depending on your location, the return shipping can take anything between a few days and a few weeks. If you are not located in the European Union, we may have to pay an import fee when your theremin is delivered to us. The amount of this fee will be added to your invoice or billed seperately. 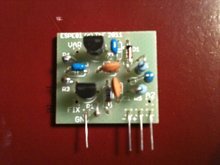 This can also be a great oportunity to have the ESPE01 module installed to increase the pitch range and linearity of the playing field! : 3-6 weeks until ready to ship, depending on configuration. Shipping time 3-12 working days, depending on location.